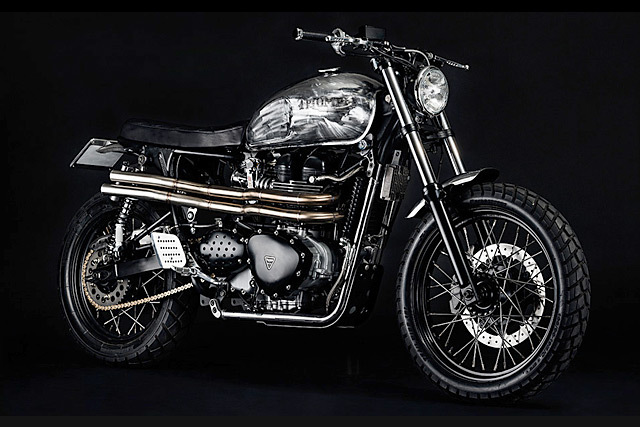 “When this beauty came in our garage we were aware we had the chance to give our opinion about this motorcycle and its role in the custom cultural process.” The key design focus of this Bonnie build was to draw attention to the bikes metal work, accentuate it where possible and remove all the plastics for a true best of British feel. The most prominent of these features is the factory gas tank that has been stripped of its paint work and even the sanding marks left in place. 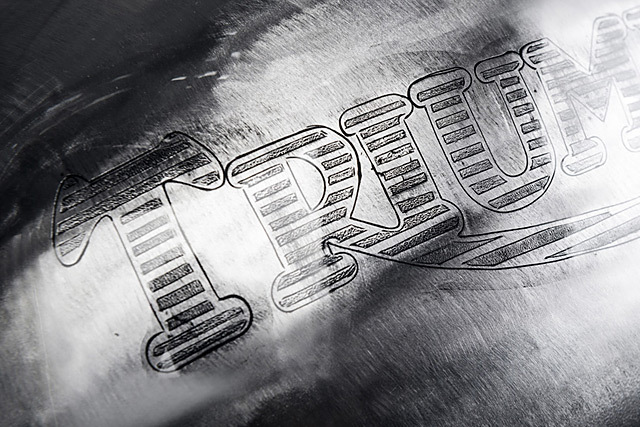 Then to show off their artistic flair, the boys hand-engraved the Triumph logo back in place before clear coating the tank to protect it from the elements. The guards have received the same treatment with the front heavily bobbed and left raw, while the rear is cut back, removed of all the lighting fixtures and then the company logo engraved to finish it off. It’s deliberately rustic with even the removable frame rail stripped of its hard-wearing paint and ground back to a raw metal finish. To take the look further and be consistent throughout the design even the smaller elements have been given the same treatment. 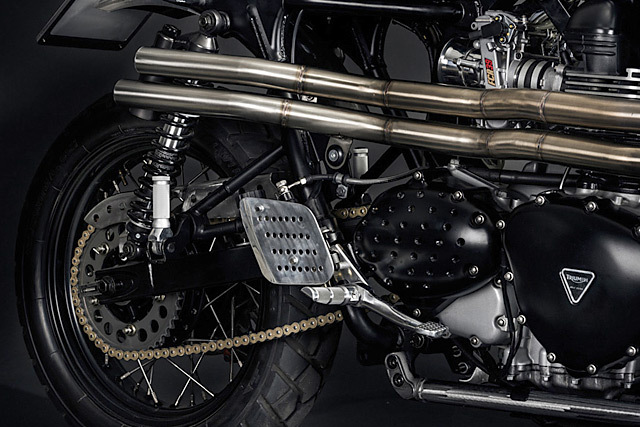 From the ground back and drilled chain guard to the large custom alloy heel guards each part is purposeful while remaining true to the design. 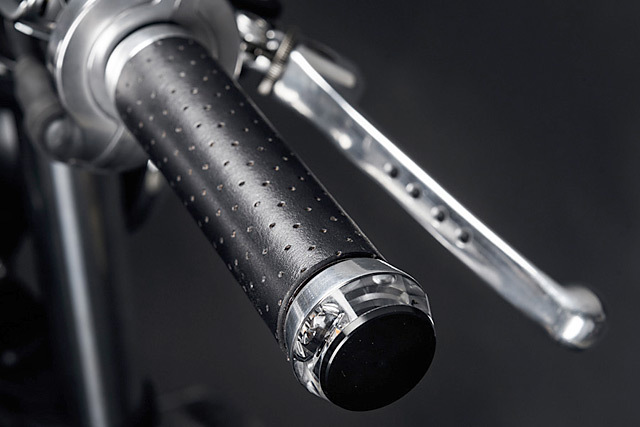 The passenger pegs have been swapped out for knurled items and the riders foot controls are now all raw metal items. 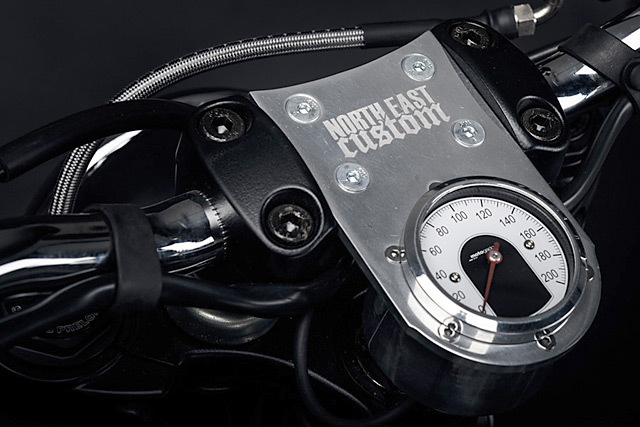 The plastic side covers have been shown the door and the negative space left behind allows the universally beloved items of the automotive world, raw alloy velocity stacks, to take centre stage. The engine is the one area of the bike where smooth metal and rich black paint allows it to be the centrepiece amongst the industrial elements that make up the rest of the build; although the boys couldn’t quite hold back and did drill out the sprocket cover. Lighting and the controls are all about keeping things simple with a nod to the past and minimalism being the order of the day. 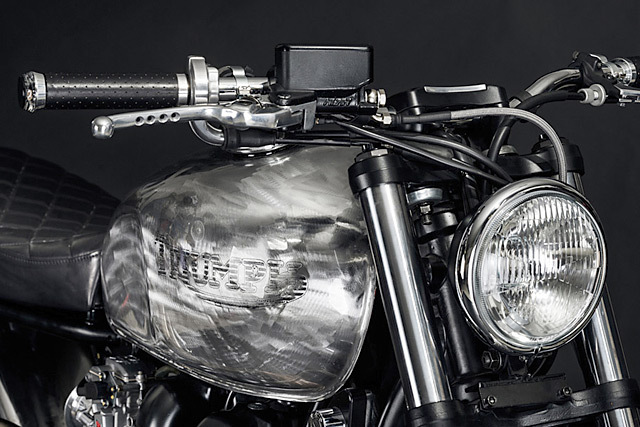 The headlight is smaller than the factory unit and set back closer into the trees while the rear tail light is an LED strip that has been neatly recessed into the frame loop. The Tracker style bars are lightweight alloy with Kangaroo leather used for the grips and drilled levers matching the body work. For a hint of the old the factory switchblocks have been ditched and old style single function units fitted, one of which controls the rear LED indicators and the front items that are attached to the bar ends. 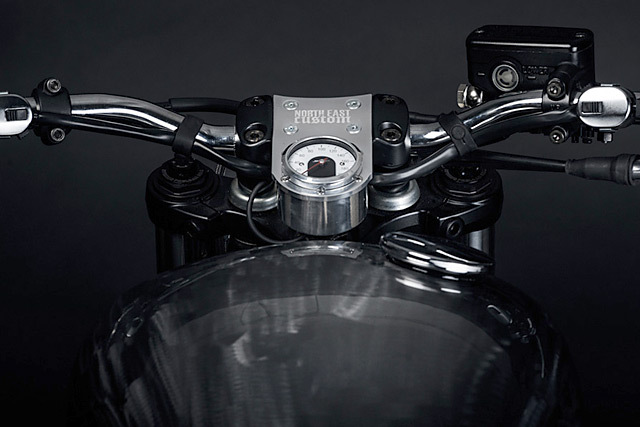 The single instrument is the ever popular Motogadget analogue item held in place by a machined alloy mount that has more company brand engraving. 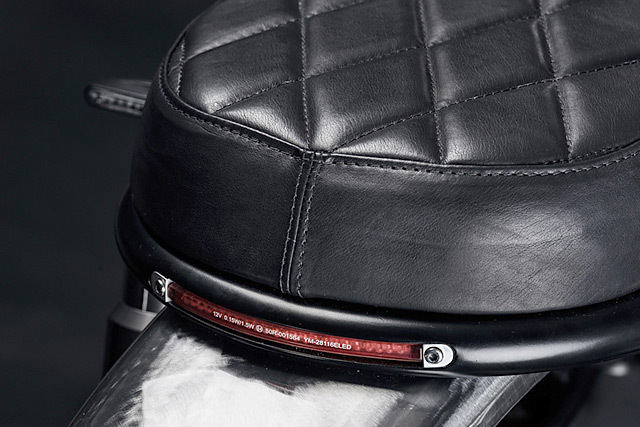 With the Kangaroo leather looking so good on the bars the same hide is used on the diamond stitched two up seat and ensures there is not a spec of colour in sight! With that extra performance on tap and sharper power delivery it made perfect sense to improve the handing of the Bonnie to take full advantage. To give the front end more feel and inspire some extra confidence the standard forks have been treated to a Bitubo fork cartridge conversion kit. But it’s out back that the big dollars were spent with a pair of Bitubo’s top of the line rear shock conversion that features nitrogen filled remote reservoirs and a full range of adjustability for height, compression and dampening. Braking has also come in for a fairly serious upgrade, the 310mm drilled single rotor remains in place but is now clamped by a whopping 6 piston PRETECH caliper. 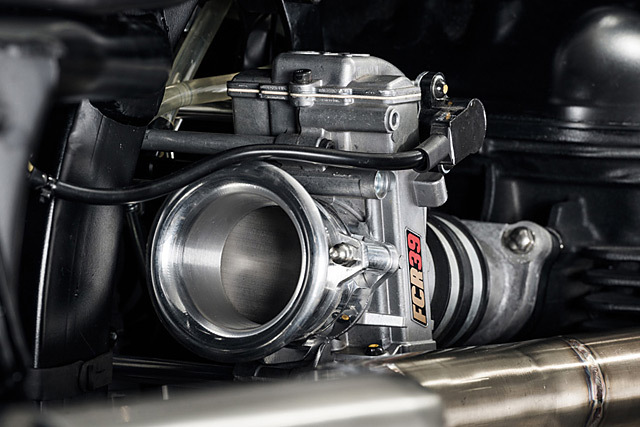 With the standard unit only 2 pistons the conversion requires a bigger master cylinder and here a CBR unit takes care of business with all new fittings and a braided line ensuring there is no pressure loss across the system. To match the theme of the build the wheels are a combination of black rims and stainless spokes all wrapped in a set of Bridgestone dual sport rubber for that go anywhere riding form and function. 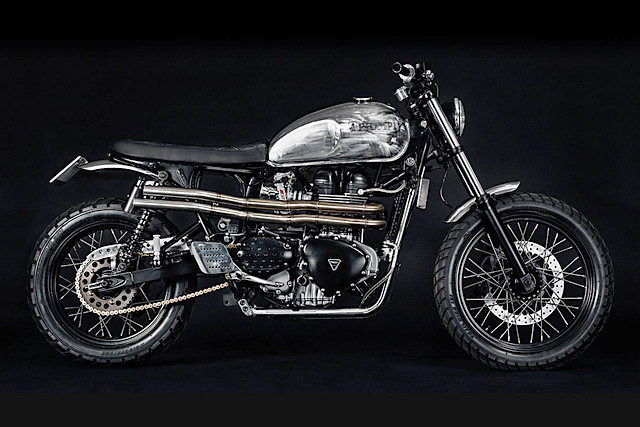 With the bike off the work stand Diego and Riki have the perfect machine to wake up the usually tranquil, historic streets of Padova and with such a culturally rich place to call home the inspiration for their next build is seemingly endless. In the mean time a quick blip of the Bonnie’s throttle will make the tourists jump for a little light-hearted entertainment on the way back to the workshop.